I would like to thank the publishers for an advanced copy of this book in return for an honest review. Shamefully, I have to admit that despite there being three Jane Fallon books sitting on my bookshelf, My Sweet Revenge is the first Jane Fallon book that I have actually read and I am pleased to say that I loved it. Paula feels her life is incomplete in a way. She has a famous actor for a husband, who gets recognised by old ladies everywhere he goes and a daughter who is about to leave home to study medicine at college. On paper, Paula's family is perfect. But Paula feels that she's let herself go, she doesn't know how or why she has put on so much weight and she is at the point where she is nearly afraid to look in the mirror. The one thing she did get right though was her family, or so she thought until a text message comes through to her husband, Robert's, phone, signally that he is having an affair with one of his co-stars. But Paula has decided that she won't go down without a fight and pledges to make her husband fall back in love with her, so she can leave him and break his heart. As the book went on, I started to admire Paula more and more. That doesn't means that I necessarily agree with what she was doing, but Paula proved herself to be strong and independent where other women would have fallen down in a crying wreck. The way that Paula took control of her life and started making changes for herself, was what I admired the most about her, because she was letting nothing come in the way of her goal. Paula, Robert, Robert's mistress and on screen wife Saskia, and her husband Josh are the main characters in My Sweet Revenge. 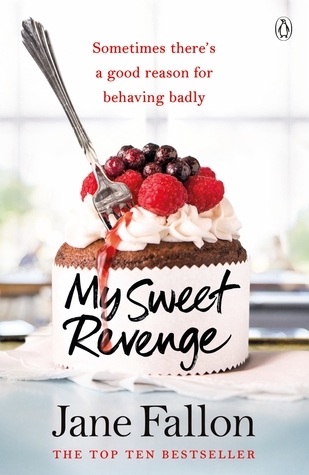 The lies and scandal that goes on with these characters throughout the book make My Sweet Revenge the funny, quirky novel that it is. I laughed and cried along with these characters and I sometimes even cried laughing at them. I have not read a book as funny and charming as My Sweet Revenge in a very long time and I really needed the laughter that it provided me with. I instantly fell in love with Jane Fallon's easy way of writing and the story just flowed. I loved that she has thrown the odd twist and turn in there too, that really kept me on my toes when reading this book. My Sweet Revenge has exceeded my expectations and I am so looking forward to discovering the author's previous books. This book is laugh out loud funny and I can't recommend it enough. You will not regret reading it! You can buy My Sweet Revenge here.